Where you get REAL Wheel Horsepower and buy Record Setting PERFORMANCE ! Here we will be showing you some of our tuning abilities on different types of cars and trucks with different types of modifications. Dyno tuning is our specialty and we strive to meet the customers goals with the best tuning possible. No matter how radical your cam or how big your motor is without proper tuning you will not get the most out of your engine and still be within a safe air fuel mixture, this is extremely important on EFI cars. If you have any questions about our tuning services or want to schedule a tuning session get in touch with us and let us show you the hidden power that might be lurking in your car. 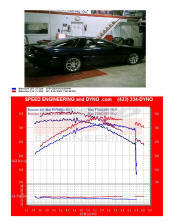 Free tuning updates with the purchase of dyno time for customers who purchase the original tune from Speed Engineering! 15.8 RWHP & 18.1 RWTQ Gain from tuning only on a '99 LS1 Corvette with Kooks long tube headers, nothing else on the car had been changed from stock. "A good dyno tune is the best mod I have made. It unlocked power that is otherwise unable to be retrieved." We gained 25.6 RWHP & 23.8 RWTQ from our tuning alone on a '01 Z28 A4 after he added 1&3/4 long tube headers his only other modifications were a Corsa catback, and a lid. The car made impressive horsepower when it came in and really impressive power when it left. This car is making RWHP like a six speed car despite the power robbing automatic transmission. "Speed Engineering's custom dyno tune will be the first mod I do to all of my future cars." John's A4 GTO gained 25.4 RWHP & 30.8 RWTQ from our custom Speed Engineering dyno tune. After he added Kooks 1&3/4 long tube headers his car was in desperate need of a tune. His only other mods were Flowmaster catback, ASP Pulley, and a K&N Cold Air Intake. Even though the peak numbers are awesome for the combination along with an automatic transmission the area under the curve is extensively impressive. "Speed Engineering gave me the best of both worlds with maximum power AND maximum fuel economy." With tuning alone on this '00 Trans Am we gained 34.5 RWHP and 33.3 RWTQ. "Had I known that dyno tuning could give me as much power as some of the best bolt-ons provide, and do it for less money, I would have had it done a long time ago." 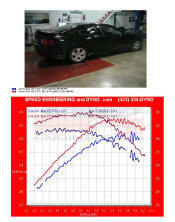 With only custom dyno tuning on this bone stock '02 SS we gained 26.3 RWHP and 32.7 RWTQ. "With the SE "free updates with dynotime" I know that no matter what mods we make to my car in the future, I will always stay tuned." With only custom dyno tuning on this heads cam '04 GTO we gained 40 RWHP and 40 RWTQ. Peak to peak gain was 39.2 rwhp and 36.2 rwtq. 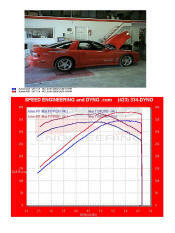 check back for more information and examples of our dyno tuning abilities.